Who could have predicted several months ago that on 25 March 2010 a splendid exhibition on Love and Lust would open in a new exhibition space at Leiden University Library? Johannes Prætorius Zetlingensis (1630-1680) certainly could have done so. 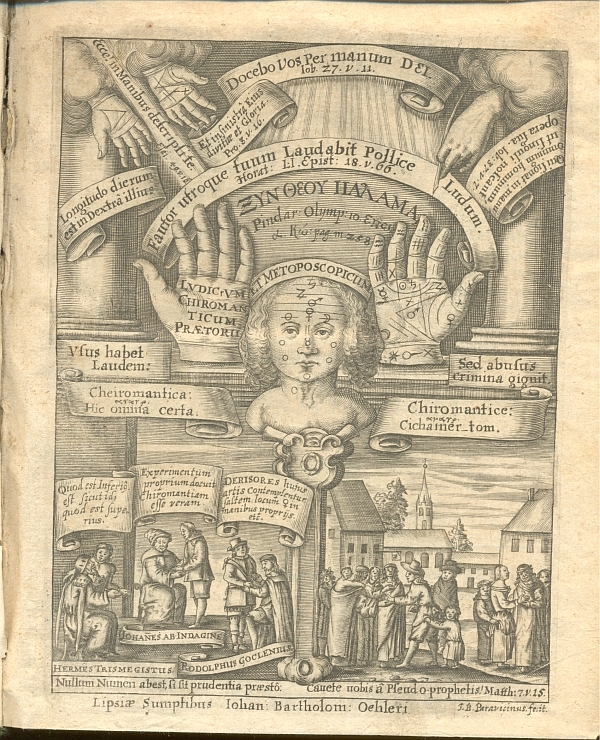 The German born author and polyhistor wrote and compiled several publications on palmistry or chiromancy (from the Greek cheir, (hand) and manteia, (to predict)), including Lvdicrvm chiromanticum Prætori: seu thesaurus chiromantiæ, 1661. Palm reading has a long history: it was practised in ancient India and was in use among the ancient Greeks. Several ancient authors, including Aristotle, Pliny and Juvenal, refer to palmistry in their books. Johannes Prætorius was a prolific writer. He amassed his knowledge from several sources at the University Library in Leipzig. He wrote books about topics such as the peoples of the earth, miracles, witches, demons, contemporary events and women. On the title page we notice several images and textual references to antiquity and the Bible in which the hidden message concealed in the lines in the hand plays an important part. For example, the book of Job is cited twice (‘I will teach you by the hand of God’) and references are made to Pindar and Horace. In the lower left corner we see the philosopher Hermes Trismegistus, the theologian and astronomer Johannes ab Indagine and professor Rodolphus Goclenius who is occupied with palm reading and the forecasting of the future. We predict a sparkling exhibition programme for the next year in an attractive new exhibition room. We hope to see and meet you again at Leiden University Libraries.